Is there anyone in or around the Seattle, WA area that would like to collaborate on this? 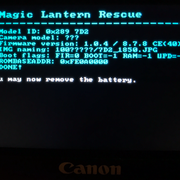 I really am ignorant when it comes to much of this stuff but I would like to help and get ML on the 7D2. 7D2 is probably the last Digic 6 cam you want to start deployment with because it's dual processor architecture is known to cause major headache. Some people are working on the first Digic 6 port for other cams. You probably have to wait long, long time to see ML for 7D2. In the meantime: Don't hold your breath! Yes, I am aware. I'm seeking someone local that I can work with and she/he can show me and work with me in person on the 7d2. If working on other Digic 6 first would make the 7d2 easier we can start there. If you find someone willing to go with Digic 6: This offer hasn't been taken yet. Can any digic 6 camera work? Can I go buy a cheaper PowerShot? I wouldn't mind if that bricked. I've got a 7d2 too. Can I go buy a cheaper PowerShot? Powershots and M3 do use other code. That's CHDK realm. FYI. 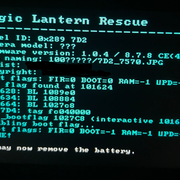 New firmware v1.1.1 just came out. Minor changes. Enhances reliability of communications when transferring images using Wireless File Transmitter WFT-E7 (A/B/C/D/E). Corrects the phenomenon of Err70 which occurs with certain combinations of settings. Corrects the phenomenon in which in very rare cases the shutter can no longer be released. Enhances reliability of operations for specific custom function settings. FYI. New firmware v1.1.1 just came out. And revoked by Canon last week. And firmware 1.1.2 in on the road. Corrects a problem after updating from 1.0.5 or earlier to 1.1.1. Problem does not happen after updating from 1.1.0 to 1.1.1. Nice to see you trying 7dmkii again. This will modify your camera. 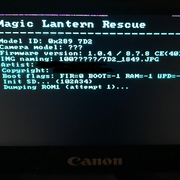 @JagoUK: I still need a copy of the 7D2 booloader (currently I have the blinked one from you, with errors); maybe you can try g3gg0's graphical dumper from the recovery branch? Tested on camera and confirm dumper didn't work btw, i'll see if I can reset my environment to compile the graphical dumper. Useful bit of info for anyone else testing. With the autoexec.bin files they will freeze on a pink screen (Even without turning power on) unless you do a specific sequence to load. Any other sequence including skipping ejecting SD card results in a pink screen with no text. 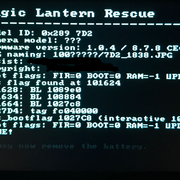 The FIR file did work ok. Not sure if 7D2 is not enabled in source though. Hey, I decided to poke around and I got this. 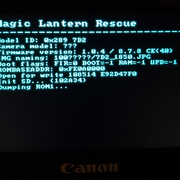 What does it mean when everything except the firmware file loads fine? Welcome to ML development! You know where to start, I suppose. Thanks to everyone for all your hardwork. Hoping this camera will become a beast someday with ML. You could try selling your 7D2 and perhaps use the $ for two or three decent used 7D bodies. Recently 10-12-bit was just finally made possible to record on it and maybe Lossless eventually will quirk its way into this ageless gem! Let me wait for sometime. If nothing happens. Sadly i will switch to sony a6500. Well I decided to pop back and check in after I found a CF card. 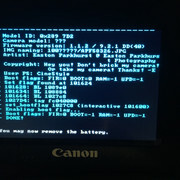 If I can find a CF card reader i'll test the PRD on it given that it finds the ROMBASEADDR..